When a megayacht owner recently approached Rokoat it was with a mixture of pride, alarm and desperation. He had always dreamed of owning a luxurious 40 metre ship with breathtaking ocean views from each stateroom and was thrilled with his new asset. He hadn’t, however, considered quite how complicated and expensive it would be to keep those spectacular windows perfectly clean and gleaming. His charter clients were, naturally, expecting perfection on board, but his captain and crew were receiving complaints about window and glass smears and impaired visibility. Despite the crew working around the clock, an ineffective harness system meant that cleaning the windows was highly time consuming and sometimes perilous. It isn’t a secret in the yachting industry that crewing can be taxing and treacherous. But what isn’t so well known, yet, is that Rokoat offers unique tried and tested coatings that substantially reduce costs as well as safety risks on board. This particular owner came to Rokoat when he was considering retrofitting a trackway harness, a huge expense that would improve safety, but substantially degrade the aesthetic beauty of the ship. One of Rokoat’s existing customers had recommended he try their SecuraKoat Glass Protect product. “The SecuraKoat Glass Protect has become one of our best sellers,” says Wayne Berry, a specialist yacht painter with 25 years’ experience and co-owner of Rokoat with Rebecca Capel Berry, a former yacht crew member. Using the most up to date hydrophobic technology, the non-stick, clear coating creates a protective barrier for any glass surface. “From watermarks, to saltwater, dirt, algae and bird droppings, virtually nothing can adhere to a surface coated in SecuraKoat Glass Protect,” he says. The benefits are considerable and immediate. 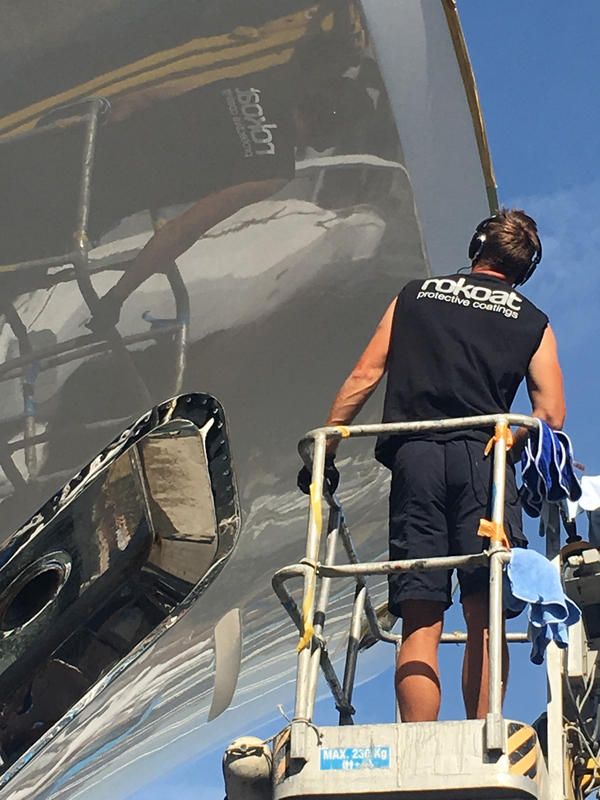 “During the charter season it makes turnovers far easier as the crew don’t have to spend hours putting the harness on and scrubbing the windows in any dangerous situations,” he explains, adding that one professionally applied coating can last up to four years reducing overall costs significantly. Rokoat’s Glass Protect product can also be used inside. A favourite application is on glass shower cubicles, which can drastically reduce the cleaning time between charters. In fact, the company has products for interior and exterior use. From paintwork to windows, glass elevators, varnish, marble, exhaust towers and stainless steel, Rokoat’s environmentally-friendly products are original and uniquely formulated to protect and revive even the most troublesome surfaces so that they stay clean and shiny. “Using our products means no more wasted time trying to remove watermarks, toothpaste and lemon juice stains on marble, often to no avail,” says Wayne. 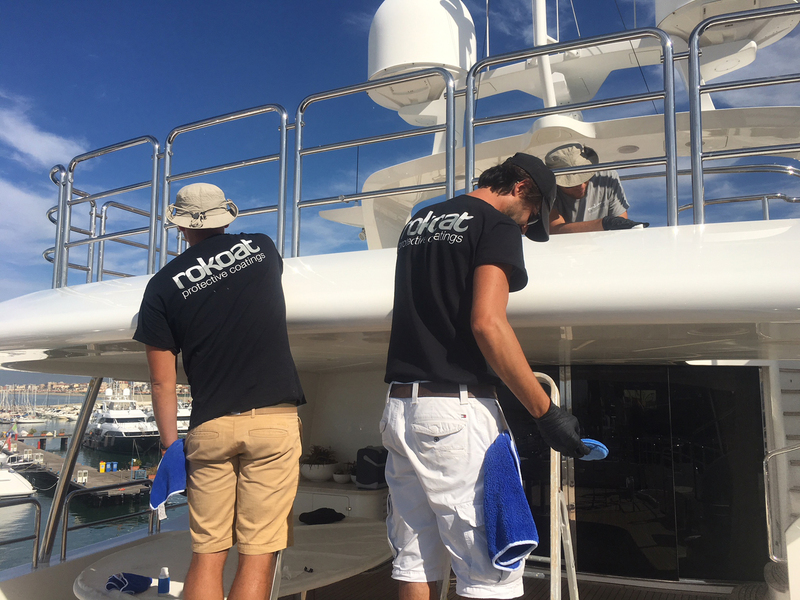 He explains that Rokoat’s products can easily halve the time deck hands spend polishing stainless steel on board. What makes Rokoat’s products stand out is that each is an original formulation that was born to provide a specific solution. “That’s why they work,” says Wayne. Rokoat is the only solutions-based coatings company in the yachting industry. The company can provide fast and effective solutions with their range of existing products or invent something new if the problem requires a tailor made solution.